I am writing this as a cold front is blowing in - AHHHHHHH. Finally, our first true taste of autumn, and it's only a month into the season. It's glorious - the humidity is dropping along with the temperature. We are looking at lows possibly in the high 40s for our run on Saturday; I'm going to wear a short-sleeved shirt and enjoy being cold! Of course, I'll warm up within the first mile, but still, the thought of being cold when I start running almost makes me tear up. I'd like to say that summer temps are over, but this is Texas and I'm sure we'll be enjoying a hot spell come Thanksgiving, so for now, I'm just going to revel in the slight chilly air. Pattern is The Kendall Slouchy Pom hat, yarn is Malabrigo Chunky, colorway is Taureg. I saw this hat pattern and liked the exaggerated deep brim, which you can wear two ways, either folded up as more of a beanie, or full on slouch. The hat used up just about every inch of yarn, so I couldn't make a matching pom pom, but I found a faux fur pom pom and I like the contrast of both the color and texture on the hat. As you can see by the pictures, Erica was surprised and happy with the hat - yay! I love it when people appreciate my knitting like that. Hey, that looks like a nicely shaped collar - good job! But then, the instructions took a turn that confused me, so I went to the help forum on Ravelry for this sweater and discovered that another knitter had the exact same question as I did at this point, only she'd posted her query seven months ago and no one had answered her. I took a shot and left a question in the forum, but after a day with no response, and after rereading the instructions for the millionth time, I finally saw where the designer just tossed in further down in the instructions how to address the issue. So I started knitting away, picking up the wraps from the short rows (this only makes sense to knitters, I realize), and then I started doing the lovely i-cord bind off, but when I got to the wraps on the other side of the collar, I had trouble getting them picked up correctly and now that side is a mess. I was ready to rip everything out and start over, but managed to stop myself from doing that because I'm still in the same befuddled boat, so restarting won't change anything once I get back to that point. No, they're not going to be worn together...I just love sock yarn so much that I can't resist casting on more than one pair at the same time. I'm almost ready to address the sweater collar again. And if I still can't figure it out, I have an appointment with my knitting guru Cary at breakfast tomorrow. Run, eat, knit - sounds about right. We here in Florida are supposed to be getting 50's by tomorrow morning. I am a skeptic and will believe it when/if I feel it. For what its worth though I hope it is true. Enjoy your weekend cool down. On to knitting I like that pattern on your hat will have to check that out. I hope you figure out how to fix your knitting dilemma on your shawl collar.Currently I have nothing on the needles which is rare for me. 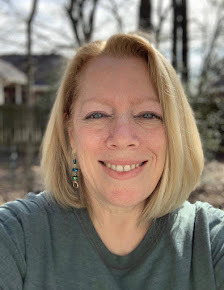 Do you follow the knitting blogs Mason Dixon Knitting? And My Sisters Knitter? Love both of those blogs. I do read Mason Dixon, but will have to check out My Sister's Knitter - thanks for the recommendation! 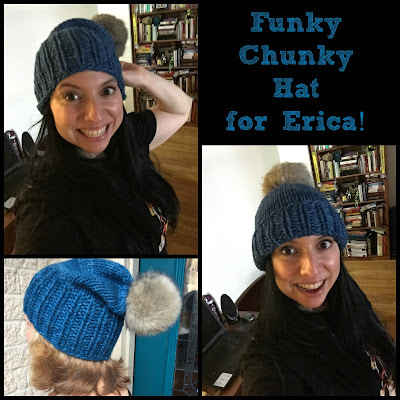 What an adorable hat you made for Erica! So I'm guessing that socks are your comfort knit compared to other things. You'll be twinning with CT on those temperatures. Enjoy your cold run lol! Believe it or not, even up here where we do have real seasons, the hardest thing to remember as they transition is that you need to feel a little cool when you leave the house. I usually dress too warm at least once. I'm sure in another month, if I see 48 degrees on the weather forecast, I'll be thinking I need to put on a long-sleeved shirt, but if I run for more than a few miles, I'd be regretting that decision. Still, I can't wait to be cold for a bit tomorrow!!! Thanks - I enjoy knitting, even when things don't go exactly right the first time (which is often, LOL). That front came through here Thursday morning - I thought you'd enjoy it, so I sent it South! You're welcome! Where does one buy a faux fur pompom? Jo-Ann's - I also found real fur pom poms, but ick. YAAAAY for a true cold front! Still waiting on one here but I know it won't be too much longer! Great job on the knitting! The hat is so cute! Hope the cold front works its way toward you this weekend! I want to figure out that shawl collar problem for you, but hopefully your in-person assists will be able to figure it out. I'm thinking something like picking up the wraps through the back or twisting they some way... what about casting on some stitches and doing a few short rows just so you can practice on something that doesn't matter? well, I'll be anxious to hear what Cary says! YAY for cooler weather!!! And you are such a generous friend--that hat is perfect for Erica. I wish you were here to help with the collar, too! I think I've lost a wrap in this mess, which is where I'm really stuck. Still pondering going in today and ripping part of it back. I knew you'd laugh at socks being comfort knitting. Never say never, I guess! OK serious question, where you be sarcastic when you said it is cold in San Francisco? (i'm an east coast gal remember, I don't know much about CA but I imagine it always being hot). I m jealous of your Texas weather. We've had 80 degree weather here which is great but I know it will be fading fast and it will be cold by Thanksgiving! No, I was being totally serious - it's windy, damp and cold in San Francisco! I remember being at a SF Giants baseball bame in the middle of summer, and the game went into extra innings at night, and they handed out buttons with snow on the SF logo because they appreciated fans staying when it got even colder there. I love your hats! I wish I had more time to knit. I recognize that sock yarn. LOL. I love that sock yarn - would love to have all the colors from that line! I wish I liked to knit! Your creations are beautiful. I can't knit for the love of God. My mom knits well. Well back in the day. I always wanted to be good at it like her, but I'could not even do the first bit. Awesome - you are an artist! Oh man! Did you figure out the collar?! That would be frustrating to not be able to find the right instructions :( Or get the right advice, rather! The hat is such a great surprise! :D :D :D :D The hat is EVERYTHING!! <3 You seriously rock!! And if you look closely at my bookshelf, you'll see the other 2 hats you made me on the second shelf. There are always there -- ready to grab -- when I need them!! !